Firstly, a confession – I’ve never actually written a blog before. I must admit, despite a few people trying to explain to me, I’m still not even sure what a blog actually is! Dictionary definitions don’t help much, “a truncation of the expression weblog”. Well, I’m not sure what a ‘weblog’ is either (or why dropping ‘we’ from the front makes it any better?). However, blogs are apparently written, “in an informal or conversational style”, which I think I can just about manage. Another disclaimer about this blog, is that being a technophobe (I don’t own a smartphone), I’ve shamelessly appropriated pictures from other people’s Twitter feeds (and am therefore not culpable for the quality of the photography!). The Natural Sciences Collections Association (NatSCA), and I go back some 13 years or so. One of the early meetings (soon after NatSCA formed from the merger between the Biological Curator’s Group and the Natural Sciences Conservation Group in 2003) was hosted by the National Museum of Ireland (Natural History), at Dublin’s famous ‘Dead Zoo’ or Natural History Museum. I was a PhD student at University College Dublin at the time, and did much of my research using the wonderful and extensive bird collections at the National Museum of Ireland. I was invited along to the conference on condition that I helped out at the evening reception as a wine server. Being a poor student at the time (used to screw-cap bottles), made a pig’s ear of pulling the corks out of many a bottle of wine! No-one seemed to mind though, and the reception amongst the zebra, marsupials and tapir of the ‘Mammals of the World Gallery’ was a truly memorable evening (www.museum.ie/Natural-History/Exhibitions/Current-Exhibitions/3D-Virtual-Visit-Natural-History for a 3D virtual tour). Fast forward to 2018, and I haven’t missed a NatSCA conference since (which may be a record outside of the main committee members?). I was delighted to be able to receive a conference travel bursary from the Natural Sciences East of England Network to be able to visit Leeds Museums & Galleries again for this year’s conference. For me NatSCA’s talks are a very important way to find out about what’s been going on in the world of natural sciences collections throughout the UK, Ireland and beyond – but the most important part is, what I’ll begrudgingly refer to as ‘networking’. When mentioning ‘networking’, there’s a danger that it might sound like a loafer’s answer; what someone going on a ‘jolly’ might be looking forward to in a meeting. However, catching up face-to-face with talented, interesting, hardworking individuals in the same field as oneself cannot be underestimated. I’m the only paid member of staff within both the Natural History and Geology departments at Norfolk Museums Service, and I’m responsible for some 1.2 million specimens. Although, other museums with similarly sized collections have more staff, it certainly isn’t unusual for natural sciences curators to be working on their own. Catching up with people in similar situations is not only a relief, I would argue it is essential for the exchange of ideas and injecting new enthusiasm into ones daily work life. 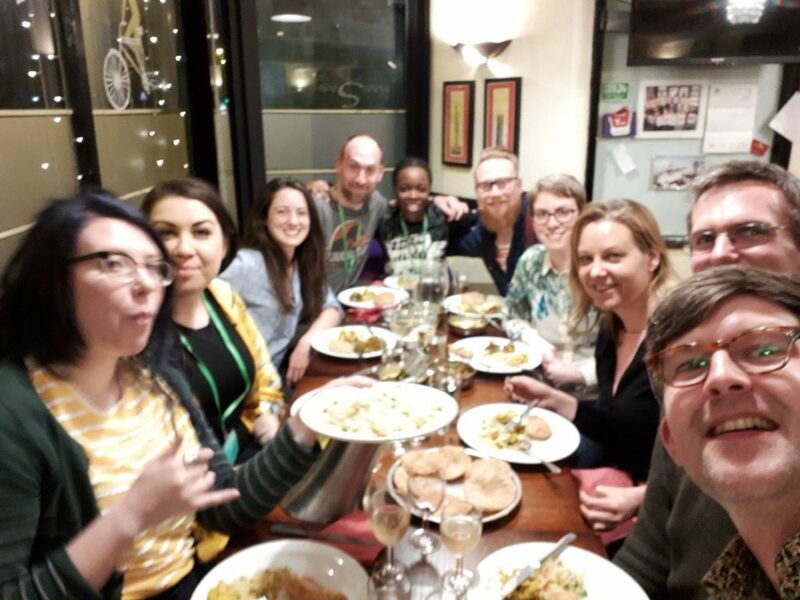 My table at the annual conference dinner at Hansa’s Gujarati restaurant, Leeds (picture courtesy of David Gelsthorpe ‘@paleomanchester’ Twitter). 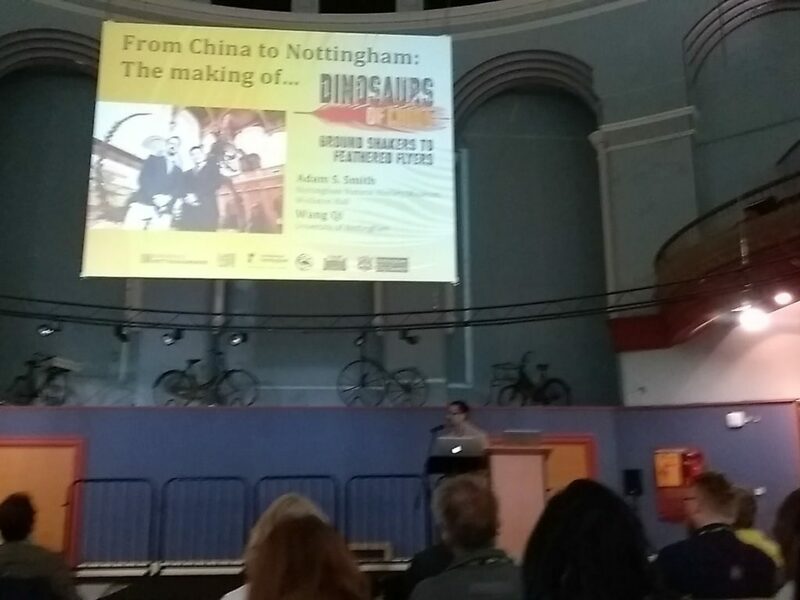 Dr Adam Stuart Smith’s fascinating ‘Dinosaurs of China’ talk (picture courtesy of RNG Herbarium ‘@RNGherb’, Twitter). Other noteworthy talks included: Jen Gallichan and Jonathan Ablett’s (Amgueddfa Cymru – National Museum of Wales, Natural History) “Great British Mollusca Types: a union database for the UK” – I have to invite the pair to Norwich to look at our mollusc collection; Jan Freedman’s (Plymouth Museums, Galleries & Archives) “The Social Media Ecosystem” – bonkers, but ever entertaining, Jan and I go back a long way, and despite not seeing each other for 12 months at a time, always manage to pick up our friendship where we left off; Mark Carnall’s (Oxford University Museum of Natural History) “Big Gay Animals: an LGBTQ+ tour of a natural history collection” – I was initially unconvinced about the scientific/educational merits of this talk, but I was totally wrong, and Mark gave a humorous, thought-provoking and enlightening talk. Will I break my own record and attend NatSCA again next year – absolutely, it’s in Dublin once again, and I can’t wait to visit my own stomping-ground, and continue to be educated, surprised, and even entertained by the marvellous people attending the conference (either socially, or more formally during the talks).